Land capability assessment is used to identify the potential for agricultural and non-agricultural land uses. It considers specific requirements of the land use and also identifies potential degradation risks. It is an important tool in Western Australia’s rural planning system. Land capability is the ability of land to support a given land use without causing damage. Assessment of land capability considers the specific requirements of the land use (e.g. rooting depth or soil water availability) and the risks of degradation associated with the land use (e.g. phosphorus export hazard or wind erosion). Land capability assessments are carried out in accordance with land evaluation standards (Resource management technical report 298). Land capability assessments are a first step in assessing land suitability for a given use. 'Suitability' considers other factors such as economics, infrastructure requirements, labour access, water and energy access, conflicting and complementary land uses, and the policy framework. 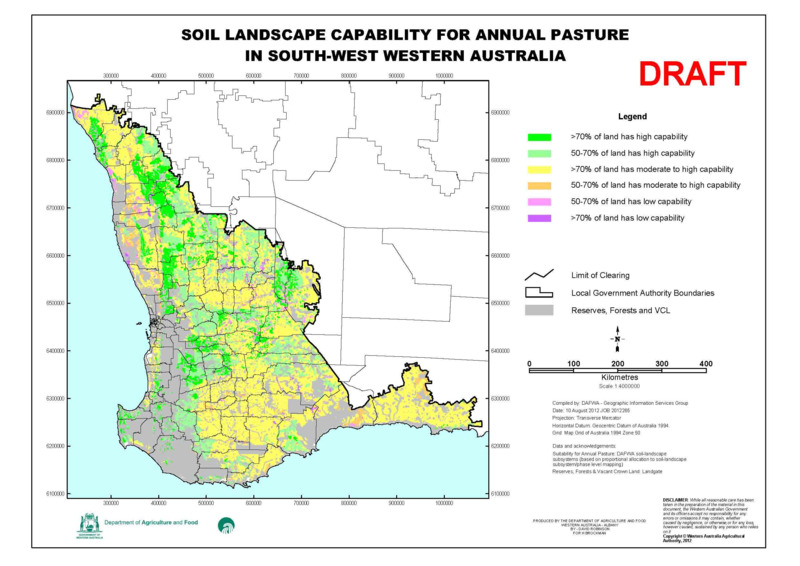 The Department of Primary Industries and Regional Development (DPIRD) has mapped land capability for 5 broad land uses (annual horticulture, dryland cropping, perennial horticulture, grazing and vineyards) for the south-western agricultural area of Western Australia. These maps can be viewed through our natural resources mapping portal, NRInfo. We use the land capability assessment method to assess land suitability for existing and potential agricultural and non-agricultural uses. The method identifies possible physical, chemical and degradation constraints to land use on particular soils and landscapes. This information is then used by planners, managers and advisers to improve sustainable development. Land capability assessment has become an important prerequisite for rural land-use planning in Western Australia. Five land capability classes are commonly used in Western Australia. Most properties consist of land with a range of capability classes. These classes are specific to the land use being considered. This means that the same area could be classed as capability class 1 for one use, and class 5 for another use. Class 1: very few physical limitations present and easily overcome; risk of land degradation is negligible. Class 2: minor physical limitations affecting either productive land use or risk of degradation; limitations can be overcome by careful planning. Class 3: moderate physical limitations significantly affecting productive land use or risk of degradation; careful planning and conservation measures are required. Class 4: high degree of physical limitation not easily overcome by standard development techniques or resulting in high risk of degradation; extensive conservation measures and careful ongoing management are required. Class 5: severe limitations; use is usually prohibitive in terms of development costs or the associated risk of degradation. When looking to develop or purchase land, the first choice should be land rated as capability class 1 or 2 for the intended purpose, assuming factors such as price and location are suitable, and water, power, transport and other requirements are available. Class 3 land is still worth purchasing, especially if suitable class 1 or 2 land is not available. When choosing land, you will also need to consider costs, water supplies, proximity to market and any extra costs or management required to overcome physical limitations. Productivity and profit may be less on class 3 land, but returns to capital may still be good because of cheaper land costs. Class 4 land requires considerable input of money or innovation to overcome limitations for the proposed use, and often alternative uses are preferable. As a guide, limitations quickly become prohibitive for dryland cropping, which uses large areas of land. However, a high initial investment to overcome limitations may be feasible for some intensive horticulture activities. In general, class 5 land is not suitable for the proposed use. In the long term, the costs involved in sustainably managing this land are unlikely to be offset by the returns from your enterprise.